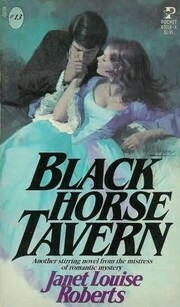 Being part of the “Pocket Goth” line, Janet Louise Roberts’s Black Horse Tavern is unlike most of the period novels I have reviewed so far. It offers a curious mix of mystery, intrigue, romance, and Gothic devices (secret passageways, concealed documents, threatening men, a mystery about the heroine’s heritage, and so forth). Frankly, I admire the author’s bravery in mixing many different genres fairly successfully. As a heroine, Maggie is intriguing. Used to rough work and prone to protect herself by playing the role of a stupid, uneducated serving girl, Maggie is a dual-identity hero in the mold of The Scarlet Pimpernel. At the same time, she is recognized by all as a lady and a virgin, set apart from the common inn sluts (who do not get treated sympathetically by the heroine or the author, to my chagrin). This leads to a rather odd and dated dynamic: much of the story is based around the idea that “blood will out,” e.g. that Maggie’s true class-status is apparent merely by looking at her. Although consistant with popular literary works of the late eighteenth century, it stretches the contemporary reader’s credulity to see the ease with which the aristocratic Wright family accepts her. Maggie’s magical ability to ride a horse with ease and competence also gave this reader pause. How and when could she have learned to ride astride a horse, considering her debased circumstances? Seth Wright is also an appealing character, and unlike many heros in romances is a thoroughly good man. Because their romance is already in progress at the beginning of the novel, Roberts provides less romantic tension and more of a focus on fast-paced plotting, Maggie’s spying, and her search for the truth about her father’s past life. Nevertheless, I give Black Horse Tavern a “Steamy” rating due to the unusually healthy and tender rapport that exists between the main characters. So many romances utilize the cliché of the rake or the redeemed bully. It is refreshing to see an author represent a tender hero as desirable and sensual. Another strength of Roberts’s writing is how she populates Black Horse Tavern with enough vivid characters that it is unclear who the villain of the piece will be. The book kept me guessing about the true motivations and loyalties of several characters. The unfolding mystery of Maggie’s father’s identity and how it ties into her current situation is suspenseful. * Yes, there is, in fact, an entire “to review” bookcase sitting in my living room.